The Specials Laboratory regularly raises funds for charities and this year seven of our team members signed up to join 300 walkers for a 26 mile trek along Hadrian's Wall. 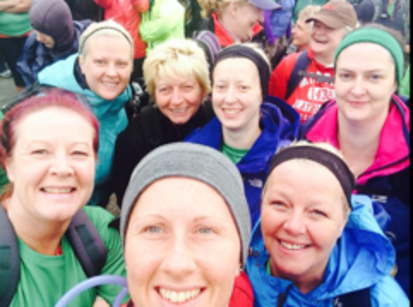 The trek took place on 16th August 2014 and our team, who trained very hard in preparation, raised a fantastic total of £3903.43 to help the work of Macmillan Cancer Support. The team raised funds by running a tuck shop, taking sponsorships and by selling items at car boot sales as well as taking donations during a charity football match. During the trek, the team spent a night at Bush Nook Guest House in Gilsland, where the owners also personally made a generous donation to the amount raised. Despite the high winds, heavy rain and blisters, the Specials team had a great sense of achievement when they reached the finish line and are delighted with the amount of money raised for Macmillan Cancer Support.